You will never be stuck for something to do in Hanoi, where ancient and proudly preserved Vietnamese culture is felt most keenly by visitors, and progress wrestles with tradition in different districts of the city. Hanoi is actually over 1000 years old so the wealth of history here is mind boggling: temples, ancient citadels, unique theatre and stunning wilderness just outside the city all offer fun-filled days in Vietnam’s capital. Make sure to visit as many of these attractions in Hanoi as possible because they all offer entertainment, beauty and education at different turns. Hoan Kiem Lake meaning “Lake of the Returned Sword” or “Lake of the Restored Sword”, is a lake in the historical center of Hanoi, the capital city of Vietnam. 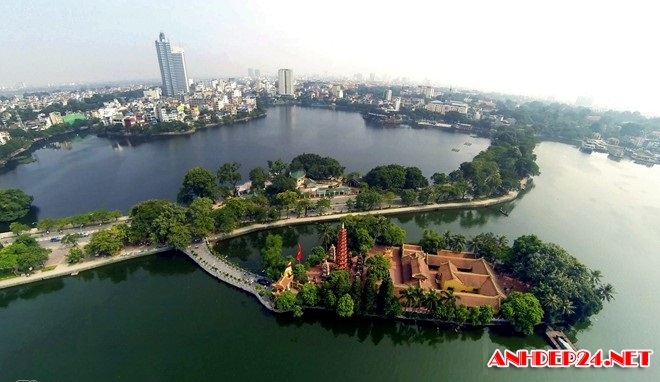 The lake is one of the major scenic spots in the city and serves as a focal point for its public life.Hoan Kiem lake (300metres away from the hotel) is the liquid heart of the Old Quarter, a good orienting landmark. Legend has it that in the mid – 15th century, heaven gave Emperor Ly Thai To a magical sword that he used to drive the Chinese out of Vietnam. One day after the war, while out boating, he came upon a giant golden tortoise; the creature grabbed the sword and disappeared into the depths of the lake. Since that time, the lake has been known as Ho Hoan Kiem (Lake of the Restored Sword) because the tortoise returned the sword to its divine owners. The Old Quarter, near Hoan Kiem lake, has the original street layout and architecture of old Hanoi. At the beginning of the 20th century the city consisted of only about 36 streets, most of which are now part of the old quarter. Each street then had merchants and households specialized in a particular trade, such as silk traders, jewellery, etc. The street names nowadays still reflect these specializations, although few of them remain exclusively in their original commerce. The area is famous for its small artisans and merchants, including many silk shops. Local cuisine specialties as well as several clubs and bars can be found here also. A night market (near Xuân market) in the heart of the district opens for business every Friday, Saturday, and Sunday evening with a variety of clothing, souvenirs and food. The Ho Chi Minh Mausoleum is a large memorial to the Vietnamese leader in Hanoi, Vietnam. It is located in the center of Ba Ðình Square, which is the place where Ho read the Declaration of Independence on September 2, 1945, establishing the Democratic Republic of Vietnam. Water puppetry “puppets that dance on water”) is a tradition that dates back as far as the 11th century CE when it originated in the villages of the Red River Delta area of northern Vietnam. Today’s Vietnamese water puppetry is a unique variation on the ancient Asian puppet tradition. Shows at this modern theatre are performed in a pool of water as the stage for the puppets. The puppets are controlled by no more than eight puppeteers hiding behind a bamboo screen. The renowned Thang Long Water Puppet show is considered to be one of the cultural highlights of Northern Vietnam dating back to a tradition that first started in the Red River Delta. Today’s performances usually include a number of short sketches rather than one long story, taking the audience on a journey of ancient village life, agricultural harvests and dances of mythical creatures. Most shows also feature the famous Legend of the Restored Sword of King Le which tells the tale of Hoan Kiem Lake and the giant tortoise. The live music plays an integral part of the show with singers often shouting words of encouragement to the puppets. Thang Long Water Puppet Theatre is one of the most popular tourist attractions in Hanoi with tickets selling out well in advance so it’s worth booking yours as soon as you arrive in town. It is also advisable to pay more to get closer to the action as the theatre seats a few hundred people and the puppets are not that big. The theatre is modern and usually shows 17 short sketches over a one-hour performance. Originally the university only accepted aristocrats, the elite and royal family members as students before eventually opening its doors to brighter ‘commoners’. Successful graduates had their names engraved on a stone stele which can be found on top of the stone turtles. The Temple of Literature is a place of study rather than a religious landmark. There are five courtyards at the temple, two brimming with landscaped gardens, the third is home to a large pond known as the Well of Heavenly Clarity, the fourth courtyard is called the Sage Courtyard and features a statue of Confucius and a house of ceremonies, and the last courtyard is Thai Hoc in which stands a large drum and bell tower. This historic site is ranked as one of Hanoi’s most important cultural places and is steeped in Vietnamese history. The layout of the temple is based upon the birthplace of Confucius with a magnificent main entrance and a path, once reserved solely for the king, running through the centre. The immaculate gardens are rich in ancient trees and are considered a serene place in which students can relax. There are stone statues and inscriptions dotted throughout the temple which has retained many of its original features as the most renowned landmark of academia in Vietnam. The Temple of Literature is a short stroll from Ba Dinh Square and is also close to the Presidential Palace and Vietnam Fine Arts Museum. The temple is between Ton Duc Thang Street and Van Mieu Street which is about 2km west of Hoan Kiem Lake. Visitors are welcome to browse some of the vast research on offer at this public museum which is also a centre for ethnographic research. The museum is packed full of information detailing traditional Vietnamese ways of life, from religious events to the symbolic rituals of all the Vietnamese ethnic groups, providing a rich tapestry of the culture melting pot existing in Vietnam. The exhibition hall features everyday objects representing each group, a research centre, library and auditorium. The outdoor display area exhibits a variety of Vietnamese homes as full-scale replicas, with great attention paid to the varying architectural styles set within the authentic and tranquil gardens. In addition, there are also leisure pursuits on display including traditional water puppet theatre and calligraphy. The future aim of the museum is to also showcase the many cultural practices and civilisations across Southeast Asia. The museum has over 15,000 artefacts including photographs and other multi-media such as audiotapes. 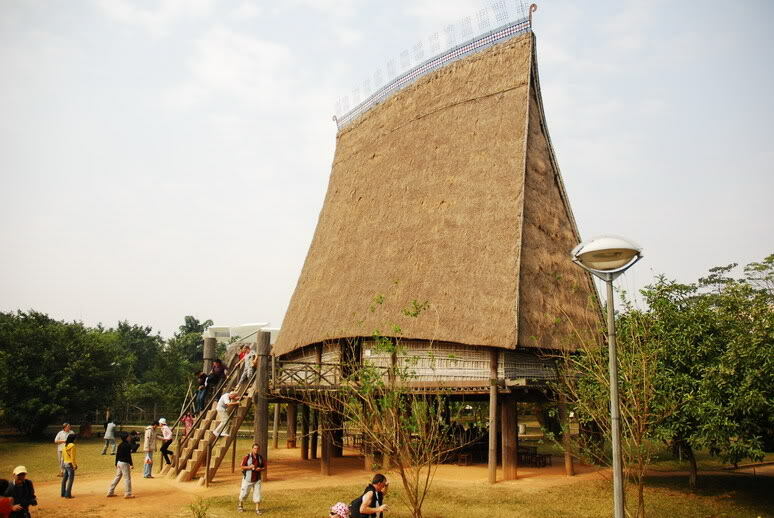 Its indoor exhibition space can be viewed via a virtual tour which includes the Viet, Muong, Tho, Chut, Tav, Thai, Ka Dai, H’Mong-Dao, Tang, San Dui, Ngai, Mon-Khmer, Nam-Dao, Cham, Hoa and Khmer ethnic groups. There are priceless antiques on display alongside everyday objects such as pipes, baskets and knives. Expect to see a wide range of interesting items on display at the museum with clothes, jewellery and items relating to weddings, funeral ceremonies and other spiritual rituals also exhibited across the 54 communities offering an incomparable glimpse of their history, heritage and cultural identity. The outdoor area presents a range of traditional homes including a Tay stilt house and a Viet house complete with indigenous foliage, each separated by a small stream and reached via little bridges. One of the main features of the museum is to present the artefacts in a simple manner so that visitors can enjoy them without being overwhelmed by detail. The museum is suitable for children and all documents and display signs throughout have been translated into French and English. 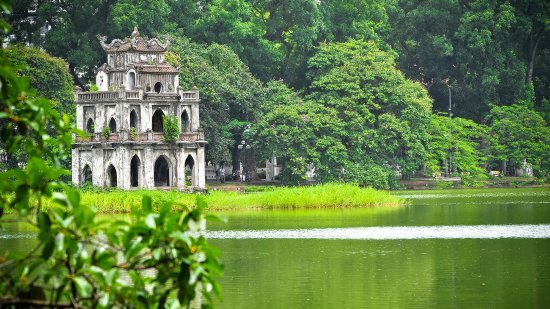 Hanoi’s largest freshwater lake, West Lake has a circumference of 17km and houses many of the city’s historic places of interest around its perimeter – including Vietnam’s oldest pagoda and one of Vietnam’s four sacred temples. The lake attracts many locals and tourists seeking respite from the busy city, providing a sanctuary of great natural beauty with plenty of quiet spots in the sizeable lush gardens surrounding the lake. Known locally as Tay Ho Lake there are a host of stunning architectural gems surrounding this spot in addition to one or two entertainment venues and a smattering of high-end hotels. The actual creation of West Lake still remains a mystery although one legend claims that it was formed when the Dragon King Lac Long Quan drowned a wicked fox spirit with nine tails in his lair. An alternative folklore source claims the lake was formed when a large Chinese buffalo mistakenly confused a pagoda temple bell with its mothers call and ran so fiercely into a small hollow that the lake was made. West Lake is a beautiful place to while away an afternoon, there are boats for hire and lunch on a floating restaurant makes a novel dining option. Notable points of interest at West Lake include Tran Quoc Pagoda which was built in the 6th century making it Vietnam’s oldest temple. Tran Quoc Pagoda resides on a small island built by King Ly Nam De as a cultural symbol of Vietnamese Buddhism. The pagoda is particularly stunning when viewed early evening at sunset. The other main attraction is Quan Thanh Temple located at the West Lake crossroads of Thanh Nien Street and Quan Thanh Street. One of Vietnam’s ancient Four Sacred Temples built during the reign of King Ly Thai To from 1010 to 1028; the temple features detailed wood carvings of sacred animals, trees and flowers in its structure. Quan Thanh Temple is open for all to enter with sightseers encouraged to pray for health, luck and happiness during their visit. The lake used to be part of the Red River when it was a retreat reserved for the relaxation of mandarins and kings, today the lake offers so much to enjoy with a unique fusion of nature at her best and some of the most historic cultural sights in the whole of Vietnam. Hoa Lo Prison, after all, is a place best known in the West as one of the prisons where American pilots who had been shot down and captured were kept as prisoners of war (although, technically, the North Vietnamese did not regard the pilots as “prisoners of war” in a legal sense). 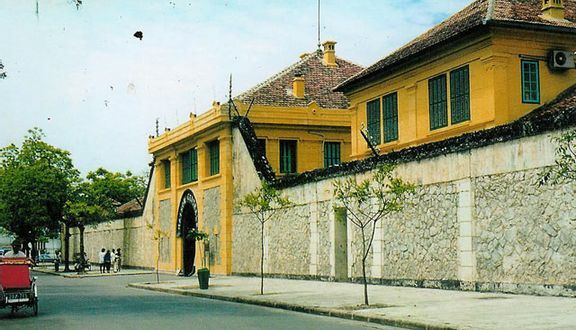 The pilots called it, sarcastically, the “Hanoi Hilton.” John McCain was held here at various times during his five and a half years as a POW. Some of the nearly 600 other American flyers held as POWs during the Vietnam War stayed even longer. It operated as a POW prison from August 5, 1964, to March 29, 1973. This market spreading from Hang Dao Street to Dong Xuan Market creates a busy and crowded walking street. on weekend evenings, a lot of people come here to stroll or go shopping, which becomes a habit. As a commercial street, you can find everything concerning clothes and recreation. 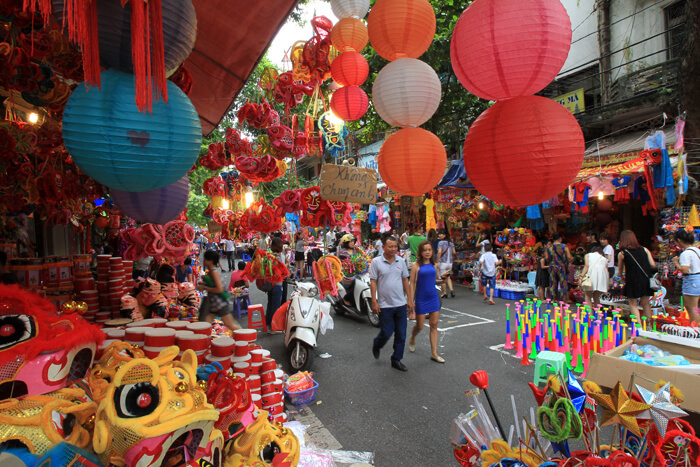 Clothes, sweets, “o mai” (salted dry fruit), decorations, toys, stationeries, sundry goods are respectively sold o­n Hang Ngang, Hang Dao, Hang Buom, Hang Duong, Luong Van Can, Hang Ma, Ngo Gach and Hang Ca Streets. All goods and facilities can be found from Dong Xuan Market to Hang Giay Street. People come here for shopping or just strolling in the crowd to feel the atmosphere of the night market and the habit of Hanoians. Children are excited about going shopping with their family, sitting o­n their father’s shoulders, holding their mother’s hand, walking in a stream of people, playing with sand pictures and painting statues. It is so romantic to see lovers hand in hand walking o­n the street, smiling, taking pictures, buying some pieces of clothes at weekends. There are lots of foreign tourists who go sight-seeing or shopping. 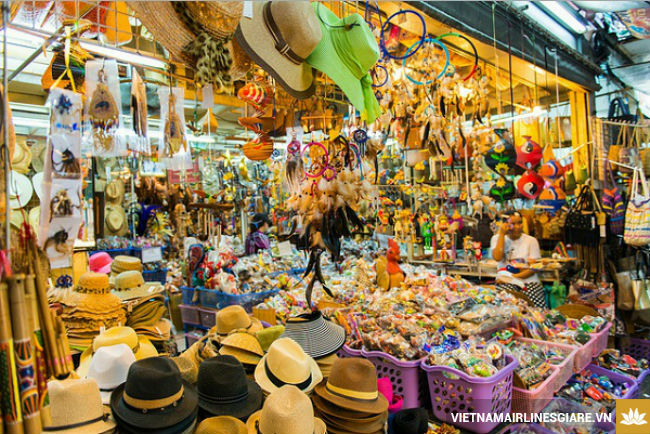 It is easy for them to find Hanoi or Vietnamese style souvenirs at low prices. Bat Trang, a small village in the north of Vietnam, is about 13 kilometers south east of Hanoi center, on the other side of Chuong Duong bridge. Why is its name popular to most tourists to northern Vietnam? The answer is its ever famous ceramic and pottery products of high quality. If you have known about Vietnam, you may not be surprised that Bat Trang’s vases, bowls, dishes, and many other kinds of ceramic products have been exported worldwide. Should you would like to contemplate workers making ceramic products by hand, just come here! What’s more, you can also try it yourself!